NASA just released an infrared composite image of Saturn’s largest moon, constructed from images taken by the Cassini probe. Because of the way the image was composed, we get to see its surface, instead of its hazy surface. 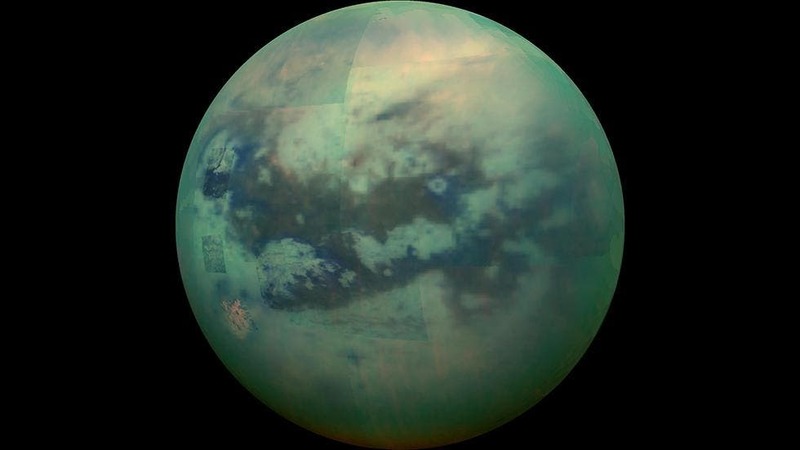 Titan is tidal locked, which means that it always sees the same face of Saturn. This image shows terrain mostly on the Saturn-facing hemisphere of Titan, including the sideways H formed by the dune-filled regions of Fensal to the north and Aztlan to the south. The colors are false, and represent the wavelengths of light collected by Cassini’ spectrometer instrument. Saturn’s Moon Titan is often described as a moon-like planet, and for good reason. It’s one of the likeliest places to find life outside of the Earth. The atmosphere of Titan is largely nitrogen; minor components lead to the formation of methane–ethane clouds and nitrogen-rich organic smog. Despite its frozen surface, many astronomers and geologists believe there is a liquid ocean beneath the ice, and some type of life form might lurk there. Titan is the only known moon with a significant atmosphere, the only nitrogen-rich dense atmosphere in the Solar System aside from Earth’s. Observations of it made in 2004 by Cassini suggest that Titan is a “super rotator”, like Venus, with an atmosphere that rotates much faster than its surface.